When you know your smile looks incredible, your life is transformed. Your self-esteem blossoms and you’re filled with confidence. You talk and laugh with ease, in the knowledge that you look incredible. At Lisenby Orthodontics, we create these life-changing transformations for our patients every day; we’d love to do the same for you! Your orthodontic goals and smile dreams are unique. 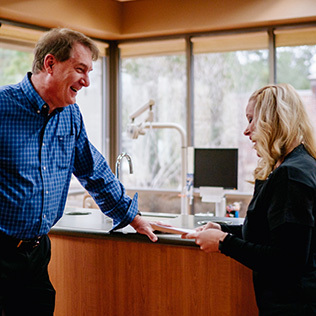 By providing gentle, personalized care, Dr. Clay Lisenby and our team members are able to help you achieve your best smile. We focus on your clinical and personal needs: your hobbies, timeline, and concerns are all important considerations. Based on what you share with us at your complimentary consultation, Dr. Lisenby will develop your unique care approach. He combines the science of orthodontics with a discerning eye: your teeth will be healthy and straight, and you’ll have a smile that’s perfect for your face. We’ll be by your side throughout your orthodontic transformation. We’ll support, encourage, and educate you. We’ll celebrate every treatment achievement; we’ll also celebrate your accomplishments in school, work, and activities. For us, the best part of orthodontics is helping our friends develop smiles they love. We look forward to helping you too! We know that choosing to have orthodontic care is a decision to make a positive, long-term change in your life. You should enjoy all parts of the process, including your visits to see us. We’re proud to have created an office where our patients tell us they feel at home. You’ll hear a lot of laughter and be surrounded by smiles while you’re here. Our team members love talking and sharing stories with our patients. Your visits are a time for us to see your progress and hear your latest news. We’ll look forward to each! You deserve the highest quality of clinical care, with leading-edge processes and advanced technology. You also deserve the best customer care. We’re here to serve you, whatever you need. Please let us know if you have questions or concerns. Please contact our orthodontic office, in Macon, GA for more information and to schedule a consultation. We can’t wait to meet you and start you on the path to incredible smiles!